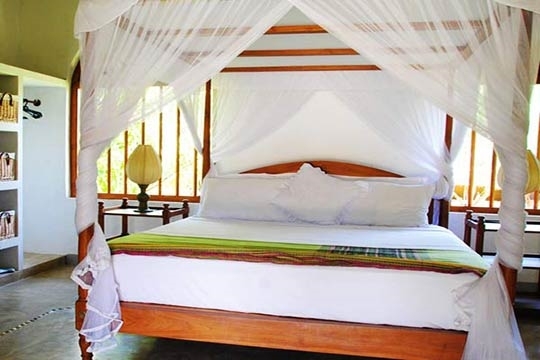 Tropical escapism doesn’t get much better than at Khomba House. 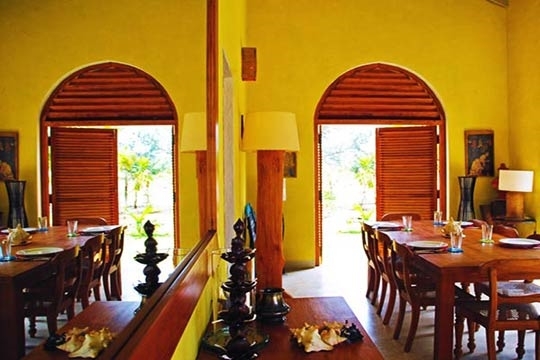 This striking seaside haven three hours north of Colombo is perched on a tourist-scarce stretch of north-west coast. The Kalpitiya Peninsular – an arid strip of land arching between the Puttalam Lagoon and the Indian Ocean – is a unique location boasting near-deserted stretches of pale golden sand shaded by thick stands of whistling pines, crunchy-leafed palmyrah palms and Khomba trees, after which the house was named. 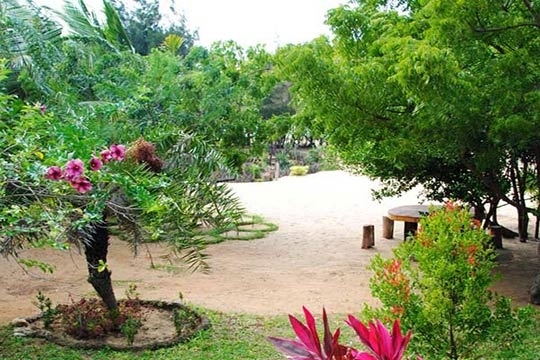 Khomba House’s private garden is huge and its soft carpet of sand is dotted with shrubs, flowers and vegetables. From fully reclining loungers and oversized daybeds in the open-sided living room, you can soak in these breezy beachy scenes exclusively to yourselves. This house just lives and breathes R&R. Even with children in tow you’re likely to devour great chunks of books in a day as it’s so easy to succumb to the sublime distraction-free setting and easy-going vibe. With two spacious bedrooms, Khomba House is amply big enough for a family and easily able to sleep up to ten (costs extra). With an adorable husband and wife team on hand to clean the house and cook (meals are on guest account), you have little choice but to relax and unwind. 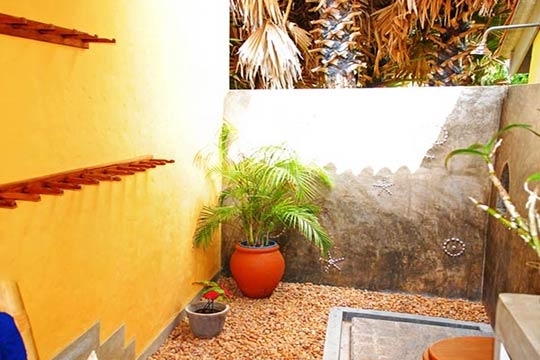 The house is very child-friendly and kids will find lots to occupy themselves here, especially outdoors – the whole garden is one big sand pit after all! Khomba doesn’t have its own swimming pool as yet but guests do have access to the facilities belonging to the low-key resorts on neighbouring Alankuda beach which include two swimming pools, a couple of restaurants, a spa and a water sports centre. Whale and dolphin watching trips run daily from Alankuda’s Boat House and you can kayak, kitesurf, windsurf, snorkel, fish and dive (with a few days notice) to your heart’s content (extra charges apply for these activities). Don’t expect to see any TVs at Khomba, it’s all about chilling out and enjoying the outdoors – there’s not even any electricity during the daytime. 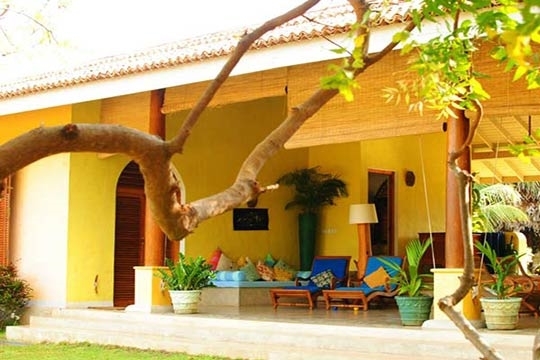 As such, the house will be a paradise for adventurous serenity seekers looking to escape the madding crowds and enjoy some much-needed down time. At Khomba House days pass by timelessly without seeing another soul. 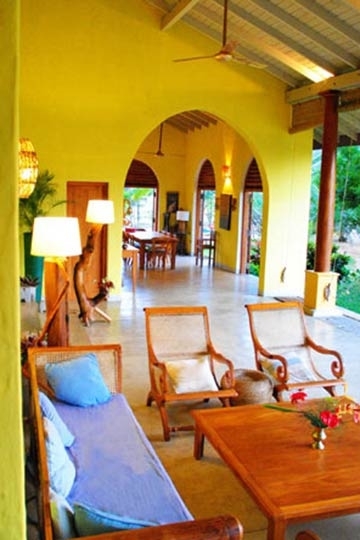 Khomba House sits just back from Alankuda beach, a divine strip of pale golden sand on Sri Lanka’s north-west coast. This area is largely undeveloped with neighbouring houses sitting in equally huge areas of land. 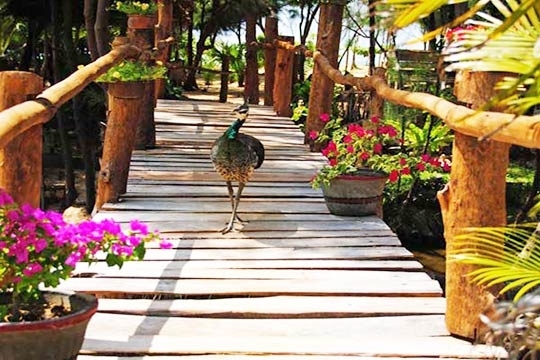 An extensive stand of fluffy-leafed pine trees extends back from the beach, and on the other side of this (and via pathways) lays Bar Reef and Palagama Beach – two rustic and very low-key resorts that share two swimming pools, a water sports centre, a spa and a pair of restaurants. 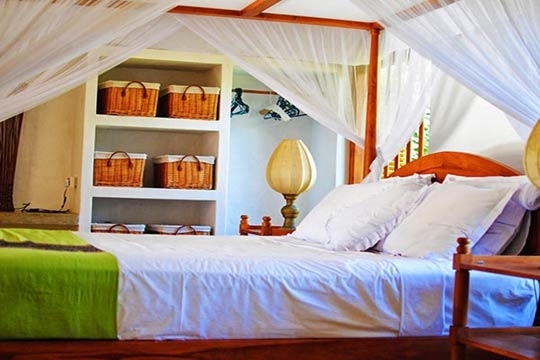 Khomba House also comes under the umbrella of the Alankuda beach resorts and as such, guests are welcome to use these facilities. To the other side of Khomba House is another privately owned property and beyond that a small rural fishing village whose beach gets busy with locals at weekends and during public holidays. 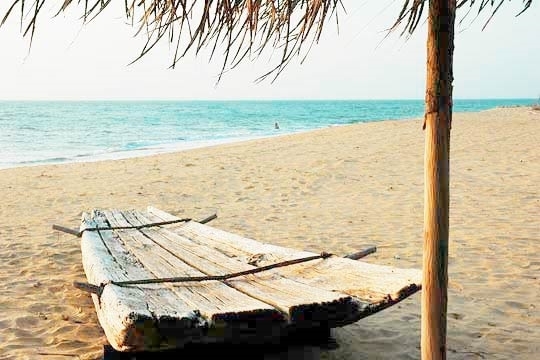 Kalpitiya is a crescent-shaped strip of land that arches approximately 40km from the Sri Lankan mainland just south of Puttalam on the northwest coast. 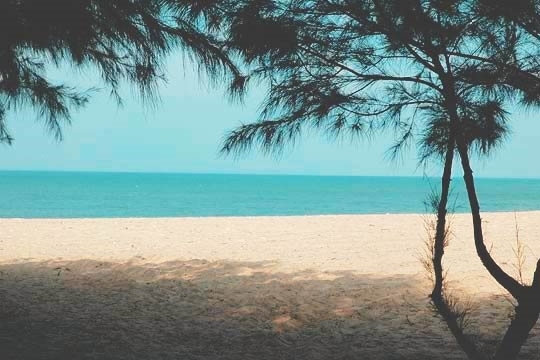 Almost entirely untouched by tourism except for the resorts that make up Alankuda Beach, this arid, mostly flat, strip of land is famous for its fisheries, its Muslim and Catholic inhabitants, its lagoons and its expansive saltpans. There’s plenty of wildlife to be seen both on land and in the sea, and bird watching is a particularly highlight. 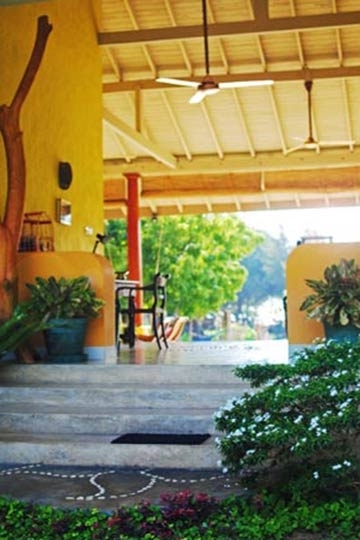 Wilpattu National Park – famed for its leopards – is an hour’s drive away. Cultural attractions to be discovered include the seventeeth century St Anne’s Church at Talawila, Sri Lanka’s most revered Catholic shrine, which sees up to 700,000 pilgrims visiting during the festival months of March and August alone. 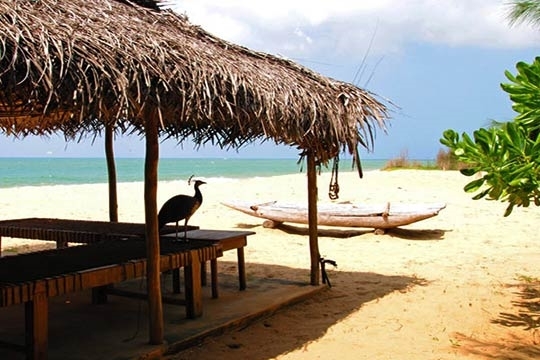 Kalpitiya offers few tourist facilities. Although banks with ATMs are available in local towns, being self-sufficient is a good option. Fresh produce, local beers and spirits can be bought locally but imported goods are unlikely to be found, as there are no well-stocked supermarkets in the locality. 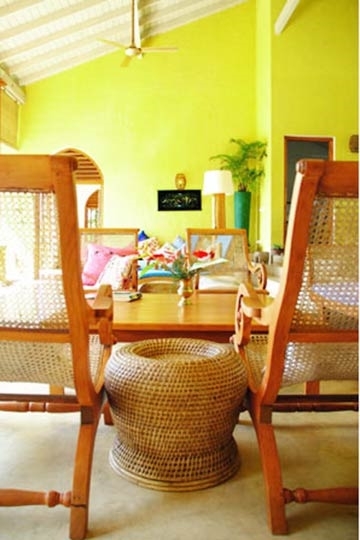 Much of Khomba House is open plan, with the living and dining areas giving pleasantly on to the gardens. The two bedrooms, toward the back of the house, are raised slightly from the living space and numerous daybeds dotted about can double up as extra beds for gangs of friends and family members (additional cost). 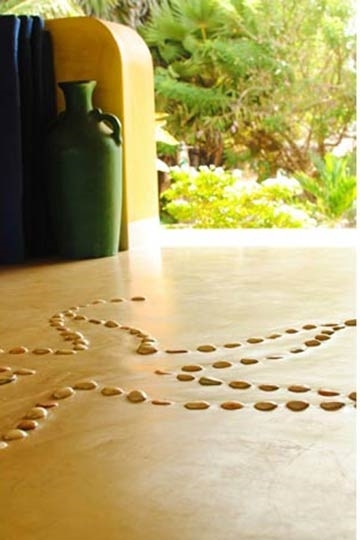 The entrance hallway of Khomba House sits between the bedrooms and leads down into the living room below. Here, a soaring ceiling supported by towering pillars allows the breezes to infiltrate and cool the interior. Clutches of vivid-coloured cushioned loungers and rattan planters chairs are placed perfectly for absorbing the extensive garden views in maximum snoozy comfort. To one side of the living room is a garden-view dining table for eight and behind this an equipped kitchen with separate staff entrance. The main bedroom leads off to the left of the entrance hall and is a hugely spacious room with four-poster king-size bed, lamp-topped side tables, a deep built-in daybed scattered with colourful cushions and built-in cubbyholes for storing belongings. To the front, doors open onto a sunken lounge with three built-in cushioned daybeds capable of sleeping an extra person apiece. 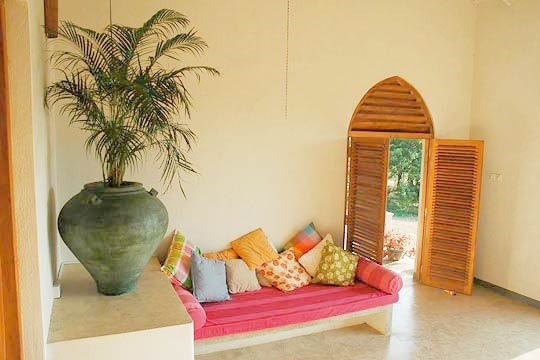 Windows open widely and a door to the front leads directly into the sandy garden beyond. From the grand bed, you can lie back and look directly out to sea. 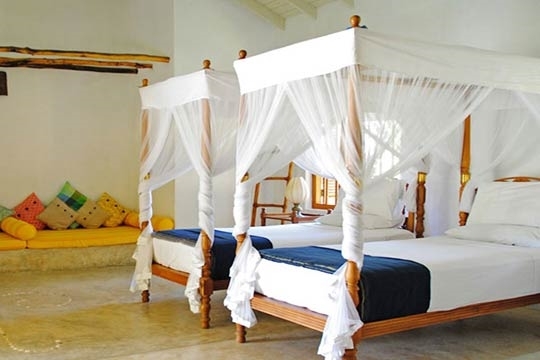 The second bedroom leads off the living room and comes with four-poster twin beds, a deeply cushioned double daybed, and cubbyholes for storing belongings. 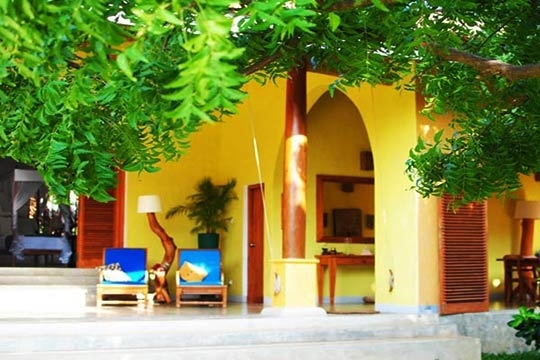 Both bedrooms are equipped with ceiling fans and come with ensuite bathrooms featuring open-to-the-sky tropical showers. 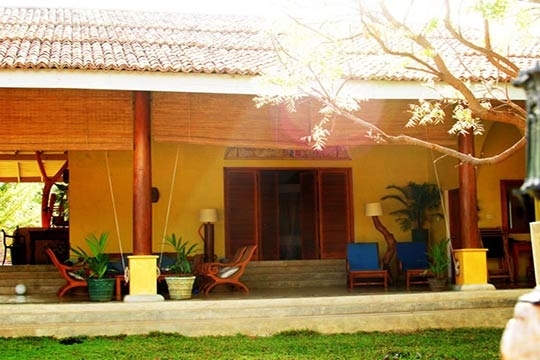 2 bedroom villa located in Kalpitiya, North West Coast. Ideal for Beachfront, Body and soul, Kid friendly, The great outdoors, Romantic retreats, Sensible for seniors, Room with a view.